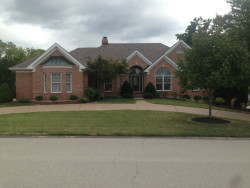 Amazing 4 bedroom 3 bath home located a highly desired area in Ballwin. 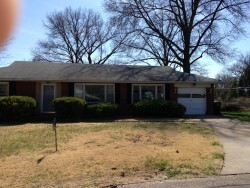 This house is on a beautiful lot that backs up to woods with tons of privacy, any home buyers dream! 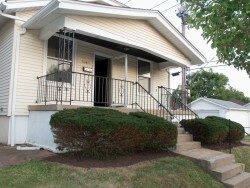 It is a wonderful split level home that has been completely renovated. There are tons of upgrades throughout the open floor plan. New roof, gutters, windows, flooring, deck, and the list goes on. As you walk in you see the welcoming split foyer featuring tile flooring and black rod iron spindle staircase. The upper level opens up to the living room, dining room and kitchen. This kitchen is every cooks dream with its wonderful over-sized island that is perfect for entertaining while you prepare your meal. But it doesn't stop there the kitchen also has brand new cabinets, high design pulls, and stainless steel appliances, granite counter tops, and tile back splash. Through the hallway there are three bedrooms and two baths. The master bedroom has a spacious walk in closet and stunning on suite with custom tile work in the shower. The hall bath has custom tile as well with a huge mirror. The lower level has a wood burning fireplace with built in shelving and another great family room area with the sliding doors looking into your park like back yard. The bedroom in the lower level could be considered a second master with another beautiful custom tiled bathroom and great walk in closet. There is still a generous sized walk in storage area. This home is perfect for entertaining friends and family with all the privacy and the big deck off the back. Hurry this one won't last long! Contact Angel today 314-724-0495 or email angel@startingpointre.com. Open House Sunday, the 21st from 11-3. Make this your next home! 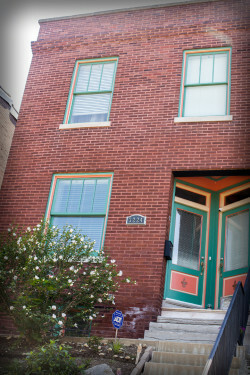 Great updated duplex 3 blocks from Cherokee St in Benton Park West. Home was complete rehab in 2014 and has been well maintained with new updates sinces. Recently painted inside and out, part finish in basement and more. Open floor plan on lower level flows from front to back with hardwood floors. Beautiful kitchen with 42" cabinets, ss appliances, center island, huge pantry and breakfast nook. Living room is loaded with windows for lots of natural light. Non-Funct F/p adds a beautiful center piece. Large Dining room, main floor laundry, and tons of cabinet space. 2nd floor adds 3 large bedrooms and 2 full baths with custom tile and adult height vanities and Jacuzzi in Master. Too many features to list but make note of all the closet space. 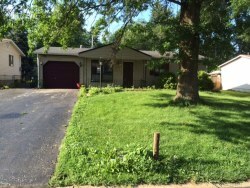 2 car detached garage and full basement add to the unlimited storage space. Fenced yard with deck and new walk-ways. New silicone roof 2016, dual heating/cooling-2014. Home is heavily insulated. City prices are rising and this home is priced right. Investors dream!!!! Needs some cosmetic repair work! 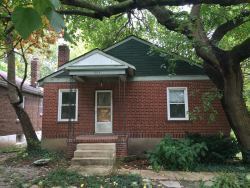 Great investment opportunity- Could be a wonderful flip or a great rental! Located in the Hazelwood School District! 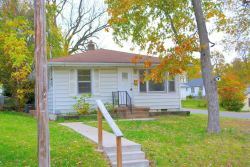 3 bedrooms 1.5 baths with a nice flat lot. Located in a nice neighborhood. Call Angel today! 636-573-1200! Will not last long! This stunning atrium ranch has great curb appeal with brick elevation, circle aggregate & paver drive with a side entry 3 car over-sized garage. Walk in to a wonderful marble entry that opens to a great room with soaring ceilings & wall of bright windows. Other features include a see through gas fireplace & fabulous view of pool & golf course! Relax in the stunning master bedroom suite, or enjoy the spa like luxury bath. This exquisite home has been completely remodeled within the last 4 yrs. The kitchen is a chefs delight with over 100K in updates; custom cabinetry, granite tops, 6 burner gas range, french door refrigerator, warming drawer, & ceramic vent hood. The lower level has a beautiful family room w/ a stone wood burning fireplace, a surround bar w/ custom cabinets, granite tops, wood flooring & built ins. Also another spacious bedroom w/ walk in closet & full bath. Out back is wonderful deck that leads down to the beautiful in-ground heated salt water pool! Won't last long! 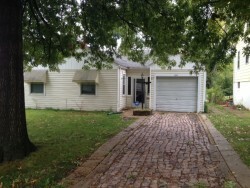 This charming 3br 2ba home with over 1400 square feet is located in the heart of Wentzville. Home features spacious eat in kitchen, dining room area with french doors, leading to the deck that overlooks the fenced backyard, pergo floors throughout the main level and ceramic tile in the walk out lower level which is complete with a fireplace. This is a must see!! !